The marshy wetland of Mangalajodi, 70 km from Odisha's capital Bhubaneswar, lines the northern edge of Chilika Lake. Mangalajodi is a birder’s paradise in the truest sense as it plays host to nearly 500,000 wintering migratory birds that seek refuge here. The habitat nurtures and nourishes them for more than four months each year. Mangalajodi is an exemplary village exhibiting the concept of eco-tourism where villagers protect the birds and play host to visiting bird-lovers and tourists. Some of these villagers used to earn their livelihood from poaching birds but after intervention by conservation groups, they have now shifted to serious conservation activities and act as guides for bird enthusiasts. 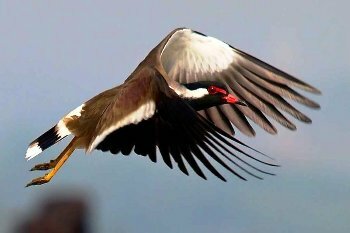 Nearly 115 species of birds are seen in Mangalajodi including Godwits, Sandpipers, Northen Pintails, Ruddy Shelducks, Grebes, Ibises, Plovers, Herons, etc.